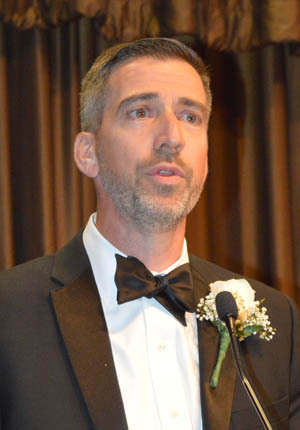 The annual dinner-dance hosted by the Maritime Port Council of Greater New York/New Jersey and Vicinity on June 9 celebrated the past with a compass pointing straight at the future. All three awardees — U.S. Rep. Cedric Richmond (D-LA), American Federation of Teachers (AFT) President Randi Weingarten and TOTE Maritime President Tim Nolan — acknowledged what has been done by the U.S.-flag maritime industry but proclaimed more is to come. Richmond not only heads the Congressional Maritime Caucus, he also chairs the Congressional Black Caucus. First elected in 2010, Richmond’s second congressional district includes more maritime workers than any other in the country. He received the PMC’s Government Man of the Year Award. 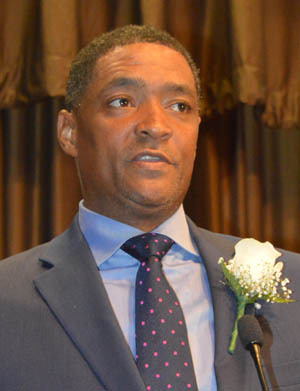 US Rep Cedric Richmond (D-LA) explains how his upbringing led him to fight for the US-flag maritime industry and all working people. He said the folks of the maritime industry are people of “courage and patriotism. They are people who make a difference. They have an obligation to this country. Seafarers Union Political Consultant Terry Turner introduced Richmond, noting he has come far in leadership in a short time because he listens and works with all. Turner pointed out that despite their political ideologies, Richmond works closely with House Republican Whip Steve Scalise (R-LA) because both of them understand the bipartisan nature of the U.S.-flag fleet. AFT Pres Randi Weingarten thanks US-flag maritime for its ongoing efforts in Operation Agua. She remembered the fight over the Jones Act in the days after Hurricane Maria devastated Puerto Rico. 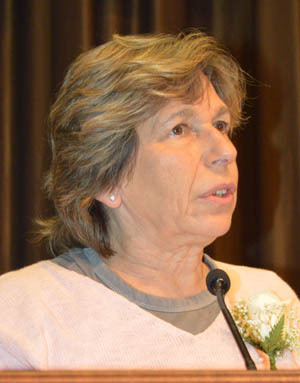 Weingarten noted that “the island looked like Europe after World War II” when she arrived days after the impact to assess what needed to be done for her members. She began a process of working with others to figure out how they could help all of Puerto Rico immediately. One problem was people were scavenging for drinkable water. As part of a coalition, the Teachers worked with Kohler to have thousands upon thousands of non-electrified water filtration systems made available to the island. A major part of the coalition was the MTD-affiliated SIU which arranged for the filters to be sent free of charge aboard U.S.-flag vessels. “By this summer, we will have reached our goal of 100,000 filters to the island. That is what America is all about! That is what you have done. From the industry side, TOTE Maritime’s newly announced president and CEO, Tim Nolan, worked directly with Operation Agua and continues to oversee relief efforts for Puerto Rico. He had been serving as president of TOTE Maritime, Puerto Rico. Nolan, the recipient of the Herb Brand Memorial Award which goes to a U.S.-flag industry leader, reminded all what the U.S.-flag companies already have accomplished since Maria as well as what still has to be done for the island to recover. MTD Executive Board Member Augie Tellez pointed out that Nolan’s character was tested as TOTE had introduced two new LNG-powered, U.S.-built, U.S.-flag vessels when the hurricane struck.